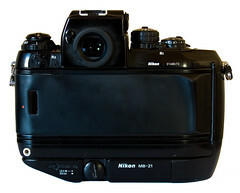 The Nikon F4 was launched in 1988 as the third improved version of the original Nikon F which was introduced in 1959. 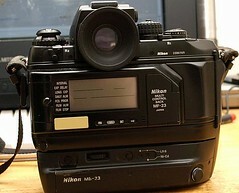 It was replaced in 1996 by the Nikon F5. Some twenty years after its introduction it was still considered by many to be one of the most capable, tough and ergonomically brilliant professional 35mm SLR camera ever made. 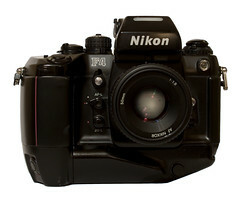 It is the last Nikon to accept the early Nikon F lenses without modification. This feature is a small steel tab on the aperture-coupling ring just behind the lens mount that can be folded away, released by pushing a chromed button next to it. Forgetting to engage the aperture coupling will either cause an "A" or an "FEE" indication in the finder using AI- and AF lenses, unless in manual mode. The F4 operates with any lens ever made for the F-mount within the functional limitations associated with the lens put on the camera. The auto-focus works as focus-assist on most manual lenses at full aperture. Using pre-AI lenses, the stop down metering will apply. AI lenses may be used in Aperture-priority automatic exposure mode, while AF lenses can be used in Shutter-priority and Program-modes as well. The F4 is larger and heavier than it predecessors, and is closely integrated with its accessories, especially its range of finders, backs and battery packs, to better adapt it to the task at hand. It weighs 1,5 kilogram (3.3 lbs) in its basic form ready to shoot with a standard F1.4 lens, while changing to MB21 adds 0.2 kilogram (0.44 lbs). The F4 is almost completely battery dependent, only film rewind may be performed manually, but it uses the universally available standard AA batteries, which should be fresh for trouble-free operation using the MB-20. The Nikon F4 is built to very high specifications, the fastest shutter speed is 1/8000 sec. The camera has a secondary shutter to ensure absolutely no stray light reaches the film, like when changing the lens in bright daylight. A small wiper assures the AF unit is dust free. There are three Continuous drive modes on the F4: CH, CL and CS for High, Low and Silent modes. The speed of the film advance is determined by the battery pack attached. The F4 also features manual or automatic film rewind, optional viewfinder information illumination, and fingertip control buttons for metering, focus and aperture lock. Available metering modes are determined by the viewfinder attached. The DP-20 finder features spot, centre-weighted and matrix metering. The range of finders available includes a waist-level finder, high-magnification finder and a large-format viewfinder for using the camera in situations where you cannot bring your eye to the viewfinder. F4 includes the MB-20 battery pack. It holds 4 × AA batteries. No vertical grip. 4fps film advance. F4S includes the MB-21 battery pack. It holds 6 × AA batteries. Vertical grip/shutter release. 5.7fps film advance. F4E includes the MB-23 battery pack. It holds 6 × AA batteries, but it can also use the high-capacity MN-20 battery pack. The vertical grip/shutter release is bulkier than the MB-21. 5.7fps film advance. DP-20 Multi-Meter is the standard finder supplied with the camera. DA-20 Action-Finder with limited metering functions and a large finder window. DW-21 6× Magnifying Finder loupe for critical full screen. MF-22 Data Back for imprinting day of the year or time of the day on the film in the lower right corner of the picture. MF-23 Multi Control Back imprints by choice date, time, frame number, a consecutive serial number, job number or exposure information; either within the frame or between them. The MF-23 also works as an interval timer when specifying starting time, interval and number of frames to expose, and as an exposure delayed start with a specified number of exposures, as well as long time exposure up to 999houres, minutes or seconds. Auto bracketing taking up to 19 differently exposed frames. A special function triggers the shutter when an object appears in focus as pre-selected. MF-24 250 frames bulk film magazine provides the same Multi Control functions as the MF-23. It is used in connection with two bulk film cassettes MZ-1 for up to 10 meters of 35mm film. This page was last edited on 12 January 2018, at 11:42.